"Sheep At Pasture" landscape painting by Eugene Verboeckhoven (Belgian, 1798-1881) Oil on panel; Signed lower left "Eug. Verboeckhoven 1862"; six old gallery wax seals verso A very fine work typical of the extensive paintings by Eugene Verboeckhoven and his mastery of anatomy is evident in his capture of these sheep as they rest in the pasture. As the last in a long line of animal painters in the anthropomorphic tradition, his extraordinary attention to detail in the sheep culminates in his handling of their facial features and expressions. The scene leaves the viewer with the sense of an impending storm, the standing figure raising his nose into the wind as he feels the breeze press against his face. Note the exquisite handling of the eyelids and the thinner fur along the faces of all three sheep as well as the exacting realism in his rendering of the chaotic wool. Eugene Verboeckhoven was a true romantic in his approach to animals, a subject matter he devoted his life to and in which he found almost immediate success in the market. His works took on a nearly quotable currency-like quality with a distinct predictability for pricing that led to very fast turnover of his work - for example, a painting with two sheep would sell for much less than a painting with three sheep, while a scene with three chickens would sell for much less. His ability to manipulate light to create drama and nostalgia in his scenes is beautifully represented in this example, the sun being hidden behind dense clouds overhead but still leaving a golden glow on the faces and bodies of the sheep in this bucolic landscape. This technical mastery of his compositions, not just in the precision of the animals, but in the cohesion of the entire scene is perhaps the foundational element that allowed him such a long career. During his trips abroad, he would collect incredible numbers of sketches of landscapes, figures and animals - these he was known to arrange like a jigsaw puzzle until he could compose a perfect moment. The present example is signed in his typical light script lower left "Eug. Verboeckhoven" and dated 1862. The back of the wooden panel is sealed with six old wax seals stamped "A.D.". The frame is a nice period frame, likely not original but rather close to the the painting in terms of date. Literature and further reading: E. Benezit dictionary of artists, Vol. XIV, Gründ, 2006, p. 144-146 Dictionary of Belgian painters born between 1750 and 1875, Berko, 1981, p.738-40 Popular 19th century painting: A dictionary of European genre painters, Hook & Poltimore, 1986 Measurements: 23" H x 26 1/8" W x 3" D [frame]; 14 5/8" H x 18 1/8" W [panel] Condition report: Professionally conserved: cleaned, varnished, touch-ups to paint around edges where frame rubs, possible inpainting to green pasture above the resting animal; old period frame with expected wear and touchups. In very Fine presentation-ready condition. See condition notes in description text. Painting of horse race by Eugene Pechaubes (1890-1967). Oil on canvas. 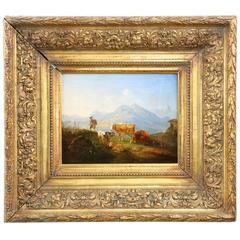 Original pertruding interior gold frame and green exterior frame with gold leaf border.